Kornati Islands National Park—which comprises numerous uninhabited islands, cerulean seas, paradisiacal beaches, and other attractions—is one of Croatia’s loveliest highlights. This full-day, small-group tour makes it easier than ever to explore the park. 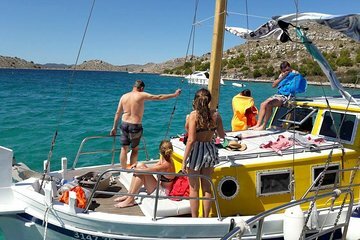 Meet at the port in Turaj—located just a quick trip from Zadar—and hop aboard your wooden sailboat. Wend your way past numerous islands, enjoy several swimming breaks, spy rugged landscapes from the water’s edge, and opt for a fresh lunch (additional expense), if preferred.